Bumper crop: According to the agriculture ministry, India is likely to produce 74.89mt of wheat in 2007, up from 69.48mt last year. 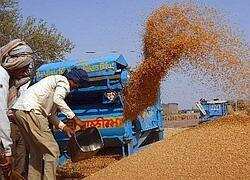 New Delhi: India has received the first shipment of imported wheat contracted this year, with 51,836 tonnes arriving at the western port of Mundra, a senior government official said on Wednesday. The country has agreed to buy 1.3 million tonnes (mt) so far in 2007. It was not clear where the wheat had originated from. India’s wheat purchase programme has attracted strong criticism from both supporters and opponents of the Congress party-led coalition government who say imports at sky- high prices were not necessary when domestic production was high. According to the agriculture ministry, India is likely to produce 74.89mt of wheat in 2007—up from 69.48mt last year. The country imported 5.5mt of wheat in 2006—the first purchase in six years, after output fell. “We hope to receive the 1.3mt by the end of October," the official said. Food Corporation of India chairman Alok Sinha last month told Reuters in an interview that India had adequate wheat stocks and hopes to build a buffer of 5.3mt on 1 April, ahead of the new crop arriving in the markets.